All transactions are safe and secure with a reliable history in online purchasing behind each of our associates. 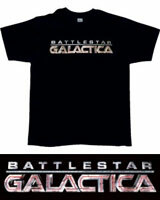 Buy the Battlestar Galactica Logo t-shirt to own Battlestar Galactica clothing and merchandise. The front of this bestselling BSG tee displays the Battlestar Galactica TV series logo across the chest. The nearly identical sweatshirt below displays the BSG flower emblem on the back. BSG 75 stands for Battlestar Group 75, a mixed-force of Colonial vessels similar to a US Naval carrier battle group. The Colonial spaceship Galactica is part of this group. Wear this Battlestar Galactica t-shirt, and join Commander Adama and the rest of the Colonial Fleet in their fight against the Cylons. In addition to the Battlestar Galactica Logo tee above, browse the Battlestar Galactica Clothing Gallery for more apparel like men's and women's clothes, kids shirts or hoodies.